Game description: Take control of a fully armed prototype mechanized robot to fight off enemies during a space colony hijack. You become the character Leo Stenbuck, a soldier who sees the consequences of fighting firsthand and learns the true meaning of life and death. Conquer missions that change each time you play, or challenge a friend to a heated match. Zone of the Enders combines rich cityscapes and intricate canyons with futuristic weaponry and an intense storyline. The player traverses across different areas of a space colony orbiting Jupiter to defeat rogue Orbital Frames, using the advanced Frame Jehuty. It is equipped with an energy sword, an energy projectile, and various sub-weapons. As the player progresses, Jehuty's arsenal grows and its abilities expand. 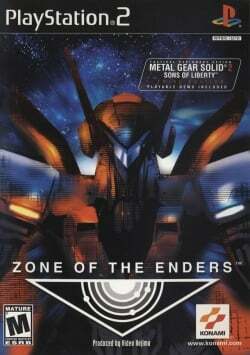 Zone of the Enders follows the endeavors of a boy named Leo Stenbuck, a colonist from the Jupiter colony Antilia under attack by BAHRAM. At the beginning of the game, he is captured and escapes when BAHRAM forces attack and his friends are killed by a falling LEV. He flees to a hangar, where he finds an Orbital Frame by the name of 'Jehuty' (derived from the Egyptian God Djehuti). Using this suit and its built-in AI ADA, he fends off BAHRAM, who seek to claim it on the orders of their enigmatic leader Nohman. Workaround: The chance of crashing can be reduced by not skipping them. A way to work around is to make well use of savestates. Description: A horizontal black line will appear in the middle of the screen during pre rendered cutscenes. Workaround: Switch to native resolution. Alternatively set the Texture filtering in GSdx to the grayed option (apply filtering only for "3D textures"). Description: The 3D map is not showing on the pause screen. Only the 2D markers if any. Workaround: Switch to software mode. Description: MAY CONTAIN SPOILERS! When Jehuty gets infected with the virus, the screen has a distortion effect at certain times. This shows up as a black screen in hardware mode. Workaround: Switch to software mode during this section of the game. This page was last edited on 2 March 2017, at 20:19.